In Dec 2009 after many years of intending to try out Advanced Driving I found an old flier in my attic from an IAM group which prompted me ‘I haven’t done this yet?’ It was now or never so I used the IAM website to get in contact with Chesterfield IAM and after an initial assessment I signed up for Skills for Life. The observers at Chesterfield IAM were very good, friendly and patient with me and my schedule. Eventually they built me up to a skills and confidence level where I was ready to take my test. I took my test two weeks ago and passed! Its been approx 6 months end to end and I’m now trying to promote advanced driving where I work (Post Office) and share my experience and what I’ve leant to others. The skills for life has shown me how to be a better driver and react to all those hazards we take for granted on the road. I would now like to become an observer myself and I do personally believe that all drivers should be to an IAM standard. The roads would be a safer place. I’m very pleased I’ve done this and would recommend to anyone of all ages to apply and get your valuable skills for life. I joined the Skill for Life course, with The Chesterfield Group, going out with Alan Morgan my assigned observer each week. He showed me how to drive safely and with confidence, drive an automatic car to its full potential, as well as providing all the necessary information to get out of difficult situations should they arise. A visit to the police skid-pan in Wakefield was invaluable as I had skidded once before and had not much idea of how to compensate for a skid, or better still how not to get into one in the first place. After doing the Skills Course my overall driving has improved beyond measure. I am no longer the person who hesitates, at a junction, does not like driving on the motorway or reversing into a parking spot. Thanks to Alan and the local IAM Group I am now a capable and more confident driver, a person who is able to negotiate anything that driving puts in front of them, as well as being a committed member of both IAM and Chesterfield group. The course is without question value for money, and all I can add to this is that it is the best purchase I have made for many years. Remember its not just a purchase for you its for your family as well; because when you get into a car with an advanced driver behind the wheel, you know you are the safest that you can be whilst on the road and nothing is ever more valuable, than your life. Being an eighteen year old lad, I am not the most popular person with insurance companies, as reflected in large premiums. This coupled with an interest to improve my driving skills and also encouragement from my parents, convinced me to sign up for the Advanced driving course. I began the course just four months after gaining my full license and having never driven on a motorway. I found experience did not play a huge part in my driving skills. I believe that if you listen to what your observer says and act on the advice given then there is no reason that you cannot become a competent driver. Due to me embarking on university at the start of October, which meant that I would be moving to York, I needed to reach test standard quite fast. 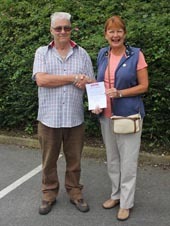 I was assigned Richard as my Observer, who was excellent throughout the programme, especially in the first two weeks when we would have a drive every day. The commitment of the Observers is superb as they will do anything they can to help you progress and enjoy the experience. After every drive, Richard would always highlight something to improve on. By not bombarding me with information, my improvement was gradual and after every session I could see some improvement. Although I was a little nervous about going on the motorway for the first time, I was guided through exactly what to do, which eased my tension and made the drive less daunting and relatively easy. I found that the course taught me many valuable skills, with the main one being improving my observation. By looking further ahead and absorbing more information from my surroundings, I can now plan further ahead for any action I wish to take. 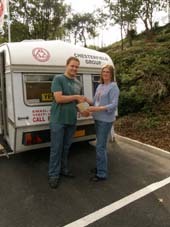 The entire Chesterfield Group are hugely supportive and friendly, and the whole programme was an enjoyable experience that I believe has improved my driving substantially. I could recommend this course to anybody who wishes to improve their driving and feel safer behind the wheel. My Mum told me about IAM and thought it a good idea as my insurance was high and my driving could be improved. Ray Parker of Chesterfield Group IAM was sent an Email for details. I attended their guidance session on the eleventh of June 2011 and was taken on a free assessment drive. Even though my driving was a little above average I was told that I would benefit by doing the “Skills for Life Course”. I signed up for this and was given a female observer called Jan, who was to take me out each week for my runs. I told her that my driving was good even though I was only seventeen and that my reversing was brilliant. You learn to do three types of reverse with IAM, a three point turn, a parallel park, and parking in a bay; my observer didn’t like giving me excellent for all three on my first drive. She knew her stuff about driving and understood when I told her that young people don’t read books. You see there is the ‘Highway Code’, ‘IAM – How to be a better driver’ to read and ‘Roadcraft’ to look through. She had it sorted by the next time I saw her, breaking things down into understandable chunks; pointing out road signs and parking under them if necessary; with good explanations as well as giving me a half-page handout at the end of each run. I was asked some awkward questions from the Highway Code but soon realised how important they were, I even took pics for her, of road signs and road markings I was not sure of. A commentary is thought a good idea, as it helps sharpen up observations and compared with now my observations were lousy. I look for foreign plates on the motorway, as they drive on the other side of the road on the continent and they might not have seen me in their mirror. I look ahead more and see possible hazards sooner, being able to deal with them more effectively. My driving is a hell of a lot better now than when I met Jan and joined Chesterfield Group IAM, and I feel more confident especially going up the A1M. 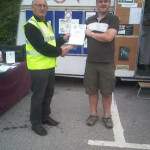 I took my test in heavy sheeting rain on the 26th August 2011 and passed it being recommended for a first. I was asked questions one being; when is it legal to reverse on the motorway? Do you know the answer? Don’t try to fool the examiner, as he is a police class 1 driver and he knows everything, even what speed you are doing without even seeing the ‘speedo’. I would recommend the IAM to anyone but especially to young people and those of you who have just passed your test. It is definitely value for money and I enjoyed my runs with Jan, driving on different roads each week. I wouldn’t ever look back, just very glad that I have done my bit with the Chesterfield Group. If anyone else is considering doing The Skill for Life Course, I’d say just get on with it, it could easily save your life. In 1951 I joined the RAF and was posted to Swinderby in Lincolnshire. Only forty miles from Chesterfield I was able to return home for the weekends. To do this I bought a motorbike and within ten weeks’ passed the basic driving test. Then about a month later passed the basic car test. Any experienced driver knows that the first year is the most dangerous and like many young drivers I nearly became a victim of over confidence and could have joined those ever increasing numbers of young people killed on our roads. In that first year I came off the motorbike three times and was fortunate to survive without injury. This experience made me a better car driver and as a sales rep, covered about 1.5 million miles overall in the last sixty years. In 1980 all employees with company cars had to take an advanced test in London and this made me a much safer driver. This year I decided to take the IAM challenge. Since then I have completed many runs with an observer watching every move I made. With so many years without accident I must have been a safe driver, but now I am a better driver. I recommend that all drivers young and old take the IAM challenge. No matter what your weaknesses are, the observers have the patience to bring you up to the IAM standard. 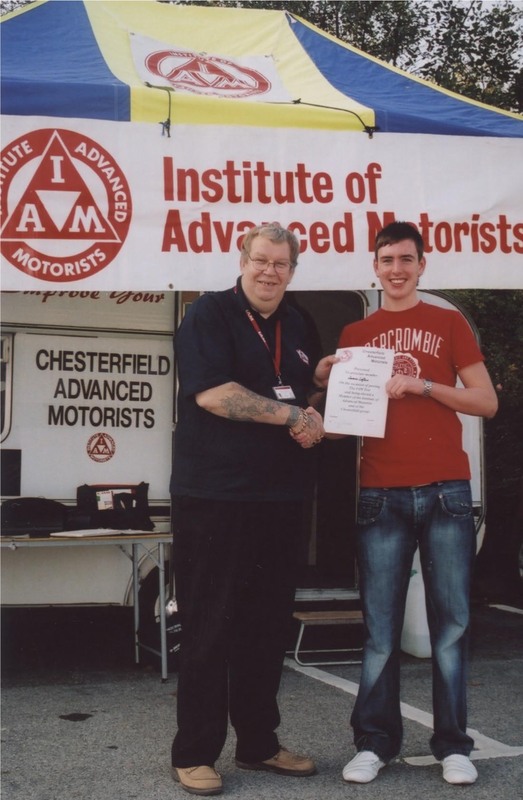 It’s now a few months since I passed my test with IAM Chesterfield. I put off writing until now as I wanted to get the measure of my progress since all those lessons last autumn. This last winter wasn’t the harshest but it was icy. At times my route to work across the moors was treacherous with snow and poor visibility. Unlike previous years I found myself with new confidence and a certain amount of certainty that if I remembered what I had been taught all would be fine. Well all has indeed been fine. I have even found myself calmer while watching others speed around endangering themselves and others. My instructor / mentor on the course was excellent. He didn’t patronise me and took things at a pace to suit me. He arranged lessons at regular intervals and let me borrow books and DVDs to help me think about my driving between times. I have to say I find it astounding that he, and others, give up so much of their valuable time. The monthly sessions were also useful as I had a chance to hear how others thought I could improve, each with their own tips but all with a similarly high level of experience and professionalism. The social evenings were also interesting and I felt welcome when I went. Although I have not been for a while I feel I would always be welcome back. I would recommend this course, this organisation, and the people who give their time so freely to anyone, if you are thinking of becoming involved I am sure you will find it worthwhile. My driving career started on January the 26th 1976 with my first experience of the Queens Highway on a moped, within a year however I was where I really wanted to be, behind the wheel of a car. My dad was a mechanic so I had been around cars from an early age and I was already able to drive our Bedford van confidently albeit off road (mainly on disused airfields). So January 26th 1977 arrived and at five thirty in the afternoon the arrangement had been made by my father, to “take me out for a spin”. Perhaps not the correct terminology for a learner driver. OMG! Rush hour in Nottingham! Vauxhall Viva’s, Hillman Minx, Ford Escorts and the ubiquitous Transit were everywhere. The van suddenly seemed massive, wouldn’t steer straight, had really sharp brakes and the clutch just didn’t seem to work the same as it did on the airfield, certainly not smooth. And for some reason every time I had to stop at traffic lights it stalled, must have been something wrong I said, muck in the carburettor said dad! So it began, and over the years I have had various cars and in them travelled many, many miles, including driving on the continent, small Greek islands and Milton Keynes! For the last 15 years driving has been part of my job travelling up to 40k per year and with increased mileage and busier roads comes more risks. However it was not these thoughts that prompted me to work towards and take the advanced driving test. It was a chance meeting Sunday morning May 2013 in the car park at Sainsbury’s Chesterfield, when my wife & I saw the IAM caravan in the corner, and decided to have a chat. My son Marcus, at only 19 had already written off one car and although we did not know it was just about to write off a second so we thought that a little extra training would do him good. Two friendly folks (Ray & Jan) took time to talk to us and explain the aims of the IAM, its benefits (particularly the potential to reduce the number of write offs that Marcus seemed hell bent on increasing), and all that was involved in taking the test. What about introducing a little competition into the proceedings to see who can pass first, father or son? And so the deal was done. Both Marcus & I signed up and after an initial run to asses our ability and see how much training we required we began our observed runs. Marcus with Jan and me with Selwyn and over the next couple of months we had various run’s out that covered everything from positioning on the road, observation both near and far and that very challenging part of the test “commentary”. It’s one thing “thinking it” but “talking it” to a relative stranger and keeping it all coherent whist still concentrating on the main objective to become a more skilful and aware road user is a different thing. Eventually it was deemed that I had reached the required standard so I put in for my test. The day arrived 16th September and I travelled to Mansfield and met with my allotted examiner Nigel Hutson. He immediately made me feel at ease for the next 1 ½ hours and felt quite relaxed and concentrated on the job in hand. At the end of the test run Nigel informed me that I had passed and with mostly 1’s and only a couple of 2’s I was very pleased with myself. Marcus is continuing to be observed by Jan and a fine job she is doing too. She has been very patient, understanding and given up lots of her own free time to support and mentor him, hopefully he will put in for his test very soon and even though I may have beaten him to the pass I feel that he is aiming for a “first”. In closing, I would just like to say that anyone wishing to improve their driving skills and throw a little challenge into their lives could do a lot worse than taking to Jan, Ray or indeed any of the other “friendly folks” at the Caravan in Sainsbury’s. The one thing that comes across clearly from all of the people that both my Son & I have had contact with at Chesterfield IAM is their enthusiasm. All give up their free time to pass on knowledge and guidance that not only makes your driving safer but more enjoyable. With regards to my driving skills now I have taken the advanced test, I feel that I am much more observant particularly in the distance with my eyes constantly flicking to main beam. I think that even whilst adhering to the speed limit I am making very swift progress and making the most of my positioning on the road. Going forward I will continue to practice the skills and positively encourage all my friends and family that drive to consider taking the “Skills For Life” course. 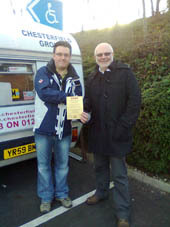 A big “Thank You” to the Chesterfield branch of the IAM from Marcus and me. For many years I harboured an ambition to pass my advanced driving test and a few years ago actually made enquiries when I saw the IAM display in Sainsbury’s car park. It was only in January this year, having retired and in need of a challenge, that I finally took the plunge. My Observer, your main ‘teacher’ was Ray Parker, the Chesterfield Guidance Officer who conveniently lived not too far away. After an initial phone call with Ray a date for my first drive was set. I was able to pick Ray up from his home, so with my car cleaned and polished and my nerved jangling off I went to start what was to be a most useful and fulfilling few months. Each week we used to go out for a couple of hours driving, Chesterfield, Sheffield, A roads, B roads, lanes and motorways come rain shine sleet and snow drifts, I did query the last one as it was one of those days ‘you did not go out unless your journey was really necessary’! I reversed round corners parallel parked and did 3 point turns over and over again until they were deemed good enough, Ray was a hard task master but I knew when he said something was good I really had made the grade. On one occastion Ray actually drove me in his car just to prove that it could be done his way. He actually took both hands off the wheel at one stage for a split second, but I promised him I would not tell a soul. As well as our regular runs I was also encouraged to go to Guidance sessions once a month meeting in Sainsbury’s car park. This meant going out with other Observers which have me a chance to get used to having someone else watching and assessing my driving and the now regular commentary I was having to do, not easy to start with but which did eventually flow. Much to my surprise I began hearing that I should be putting in for my test. Going out and enjoying driving to a much higher and safer standard was one thing but a test! But why come so far and not prove what you have learnt, so my test was applied for. I had actually been to an IAM Social where one of the Examiners explained how the Test was conducted and what they were looking for, no speeding was high up there. I took my Advanced Driving Test in July and passed, what a relied and a Certificate to prove it. Mu driving now is vastly improved, I’m safer, more observant, more speed aware and more tolerant of other drivers. I hope you have realised from this piece just how much I enjoyed my IAM experience. If you like driving and want to improve your skills or are a wary driver and want to gain confidence, I would recommend you talk to a member and see how they can help you.